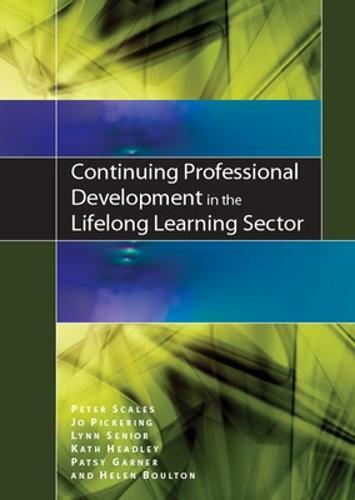 This comprehensive guide to continuing professional development (CPD) in the lifelong learning sector (LLS) provides teachers with practical support and guidance alongside development activities. It encourages teachers to reflect on their practice and subsequently shape and develop their teaching in response to the needs of their learners, their institution and local and national priorities. The book emphasises the importance of teachers as professional individuals who are responsible for their own CPD. It also helps senior managers to create a positive environment and 'learning organisation' in which teaching and learning can flourish. Offers an understanding of the CPD process and the need for undertaking reflective practiceMeets the needs of new teachers, trainers and tutors in the sector Considers CPD for teaching and learning and subject-specific CPDProvides an introduction to action research and case studies of research into teaching and learning in the sectorAccessible to anyone who is working, or training to work, in the LLS, this book will provide practical suggestions, ideas and activities to stimulate activities and research.